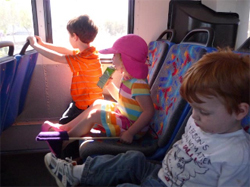 Learn about transportation resources for student parents and their kids. Children are permitted on all UCSD shuttles except for the Scripps Institution of Oceanography (SIO) shuttle or any shuttle that runs on a 15-passenger van. The SIO shuttle may upgrade to a different vehicle in the future, at which point the university policy regarding minors will be re-evaluated. If you encounter any concerns while boarding a UCSD shuttle with children, please kindly request that the driver "contact UCSD shuttle base" via the radio system for assistance. U-Pass is the universal transit pass program for UC San Diego students, offering unlimited ridership during fall, winter, and spring quarters. Also see a list of bus routes serving the campus. For more information, visit the Transportation Services website.